2 Firefighters Killed, 500 Structures Destroyed as Flames Rage in Calif.
A wildfire that roared with little warning into Northern California's Shasta County has claimed two lives as thousands of people scrambled to escape before the walls of flames descended from forested hills onto their neighborhoods, officials said Friday. The blaze grew to 75 square miles by Friday night and had leveled at least 500 structures and burned 48,312 acres, leaving neighborhoods smoldering and 37,000 people under evacuation orders. Two have died while battling the raging Carr Fire: Redding fire inspector Jeremy Stoke and a contractor hired to try to contain the flames with a bulldozer. Authorities have not released the name of the contractor. The Redding Fire Department and Stoke's brother Seth Stoke both posted to social media about the loss. "Jeremy died while battling the Carr Fire. We ask for your thoughts and prayers for his family and the RFD as we process this tragic loss," the fire department posted on Twitter. "My big brother Jeremy Stoke was the firefighter killed last night on the fire. He is one of the best men I have ever known. I only hope that I can one day fill shoes as heroic and honorable as his and make him proud." The fire, which created at least two flaming tornados that toppled trees, shook firefighting equipment and busted truck windows, took "down everything in its path," said Scott McLean, a spokesman for Cal Fire. "Really, we're in a life-saving mode right now in Redding," said Jonathan Cox, battalion chief with Cal Fire. "We're not fighting a fire. We're trying to move people out of the path of it because it is now deadly, and it is now moving at speeds and in ways we have not seen before in this area." 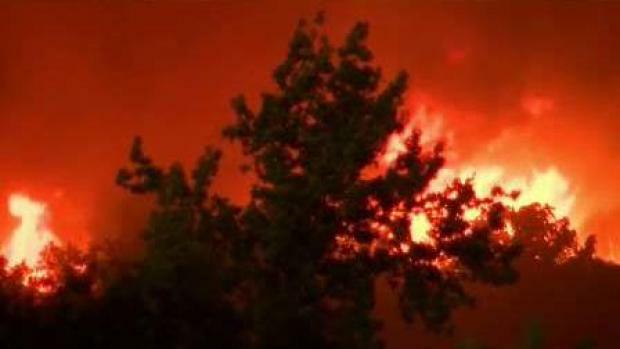 A reporter with Redding television station KRCR choked up as she reported live updates about the fire before the station had to go off the air later. Two news anchors told viewers that the building was being evacuated and urged residents to "be safe." 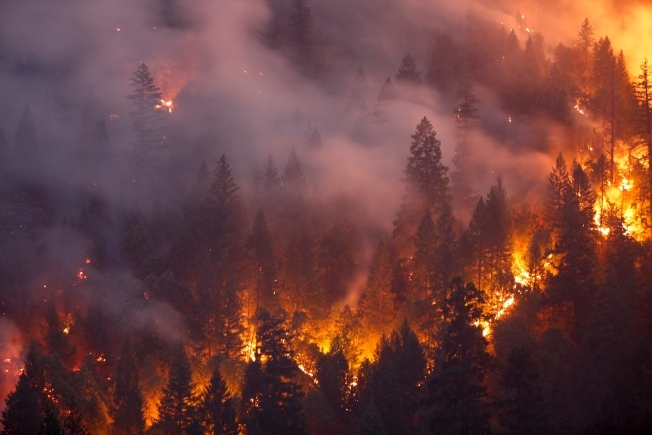 Journalists at the Record Searchlight newspaper tweeted about continuing to report on the fire without electricity in their newsroom, and a reporter at nearby KHSL television wrote on Twitter that the station's Redding reporters were "running home to gather their things." The fire began Monday with a mechanical failure of a vehicle. It grew completely out of control on Thursday amid scorching temperatures, low humidity and windy conditions. 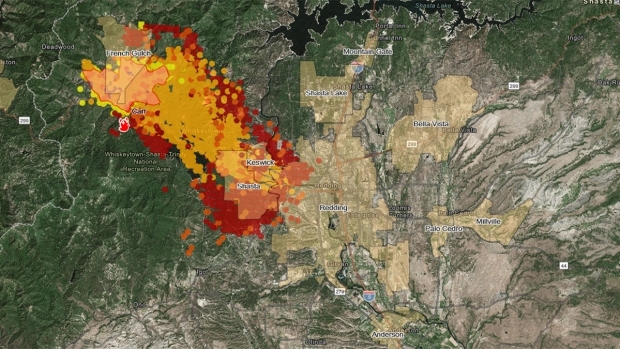 Doubling in size, it tore through two small communities and reached the city of Redding. Earlier in the day, with flames exploding around Whiskeytown Lake, people tried to save boats at a marina by untying them from moorings and pushing them to safety. But it wasn't swift enough to spare them all. Dozens of charred, twisted and melted boats were among the losses at Oak Bottom Marina. Hundreds of miles to the south, the Cranston Fire grew to 7.5 square miles and about 3,000 residents remained under evacuation orders in Idyllwild and several neighboring communities. That fire, which destroyed five homes, is believed to have been sparked by arson.